If you are like me and it's expensive to get away from your home group you might try upping your activities there. That's what I've done. I'm still doing my usual blogging and helping with kingdom events the Barony of the Lonely Tower hosts. There's always one or ten handcraft projects to do. But my new passion is developing more fully my Jehanne Bening persona. About 2008 or so, I became Jehanne Bening from 15th-century Bruges after starting my SCA life as Siobhan le Blake from early 14th-century Galway, Ireland. I made the change because I couldn't then find any female illuminators in Ireland. That's about as far as I went with it until now. I'm so excited because I recently learned even my ancillary interest areas fit within that persona. There are records of women illuminators in Bruges guild logs. And a note of one living in the Beguinage there. That fits Jehanne. I found that information reading the tome Illuminating The Renaissance: The Triumph Of Flemish Manuscript Painting In Europe. Edited by Thomas Kren and Scot McKendrick and published by the Getty. 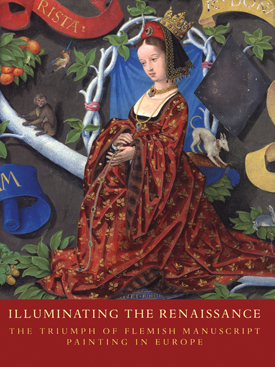 This beautifully photographed catalog tells about the finest illuminated manuscripts created in Europe during the greatest era of Flemish illumination, the reign of the Burgundian duke Charles the Bold. It begins in 1467 and ends in 1561 with Simon Bening's death. Jehanne was born in 1439 and lives as many years as I do. To me, this is illuminations grandest epoch and Bruges its greatest city. Illuminators of that time and area made stunning, innovative use of color, light, texture, and space. They created a dominating natural style that was demanded throughout Europe for a century. My renewed fascination for this book - I've owned it for years - is its information on the illuminators' activities and roles in the County of Flanders during the Northern Renaissance. Especially for women. This book gives information such as there were more women illuminators than women painters of tempera and oil because they could do this at home without a ladder and large easel. That's fascinating to me. It makes 15th-century women illuminators seem real. I can't read enough of this book at one time, now. It is too large to read casually and I want to soak up everything as I do it. Not just its gorgeous pictures.